Nuby Printed Pacifier | Yellow | Massage and stimulate your baby's gums. 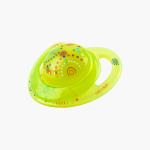 Keep your baby occupied by getting this pacifier. The soft teat is gentle in the mouth and it massages and stimulates your baby's gums. It comes with a cover that prevents it from dust. Feature 3 : Comes with cover to prevents from dust .